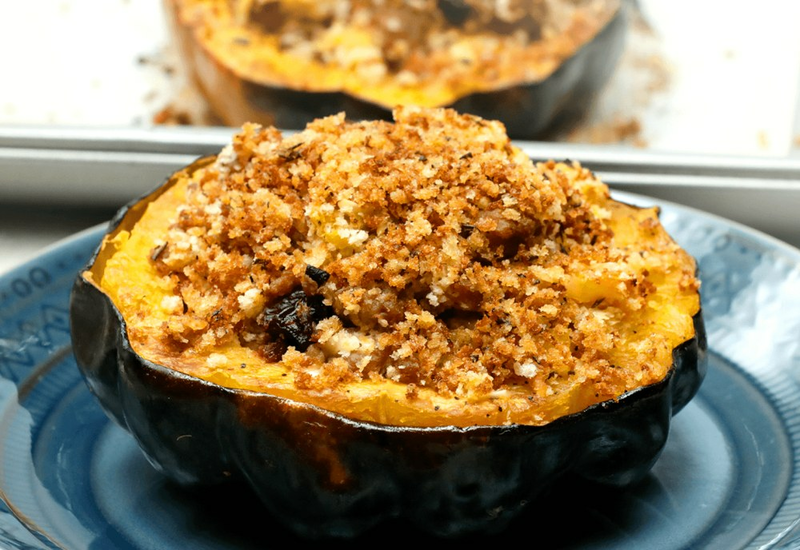 Acorn squash are roasted until tender, then stuffed with a squash, cheddar cheese, and ground turkey filling. The ground turkey is spiced to taste like sausage, without all the fat and calories. Substitute ground chicken or pork for a different lean protein option. Per Serving: 836 calories; 50g fat; 52.3g carbohydrates; 47g protein; 181mg cholesterol; 848mg sodium. This was my first time cooking acorn squash! I usually make spaghetti squash with ground turkey, so this was a nice switch. The cheese mixed in with the panko was delicious! I'm usually a picky eater so I was hesitant about the cherries at first, but they were a nice addition. I bet this dish is also good with dried apricots. I'm so glad to have found a new weeknight meal! Really good weeknight meal! I love the breadcrumbs, gives it a nice crunchy topping. I love it as much as I enjoy the zucchini or stuffed squash boats. This is going to be a fall staple!